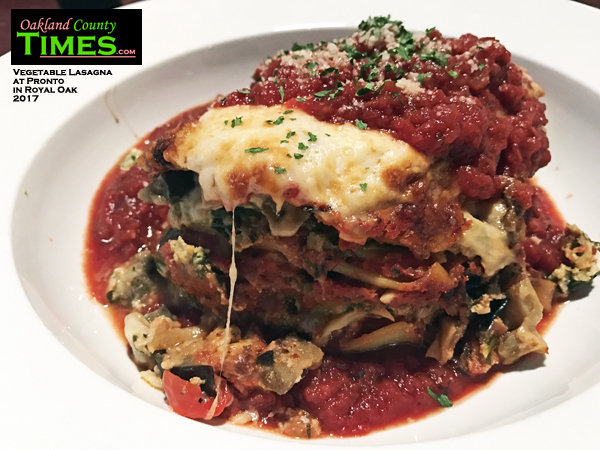 Royal Oak, MI – I almost ordered the “Smac and Cheese” when I made a recent visit to Pronto in Royal Oak, but that nagging voice of adulthood told me to go for the Vegetable Lasagna instead. Thankfully, my inner voice is pretty good at life choices, because this meal was absolutely fantastic. Frankly, most places get vegetable lasagna wrong. But with Pronto it was obvious that the veggies were not the soggy over-processed kind that often are used in this kind of dish. Here there was the right mix of flavorful cheese, perfectly cooked pasta, rich tomato sauce and hearty chunks of vegetables. My normal go-to dish is the chicken pot pie, which is the best I’ve had anywhere. Other items that sound interesting for future visits include: cranberry apple chicken quesadillas, the Bavarian smoked salmon sandwich, or the Godfather Bender sandwich made of salami, ham, mozzarella, banana peppers, lettuce, red onion and house Italian dressing in a ciabatta wrap. The Smac and Cheese that temped me is not a typical dish, but a feast of elbow macaroni, diced chicken and sliced mushrooms in a creamy dill sauce topped with crumbled bacon, mozzarella and Parmesan cheese.